Lord Byron : Liliah and Floatboards, 1825. Voyage of the H.M.S. 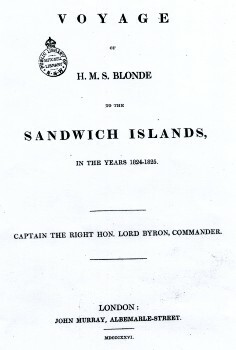 Blonde to the Sandwich Islands in the Years 1825-26. John Murray, Albemable Street, London, 1826. HMS Blonde, under the command of Captain George Anson Byron, was sent to Hawaii in 1825 to return the bodies of King Kamehameha II (Liholiho) and Queen Kamamalu, both of whom had died of measles, aged 28 and 22 respectively, while visiting England. The ship's chaplin was Richard Rowland Bloxam, who was a contributor to the the officially published account of the voyage, in 1826. There is a brief description of Hawaiian woodworking skills (pages 137-138) and of Polynesian (Cook Island) canoes and the natives skill in negotiating difficult surf conditions (pages 209-209). "Bathing is their chief amusement and alone induces many of the higher ranks of them to leave their houses, where they spend most of their time sitting or lying down asleep on mats. But the whole tribe is so fond of bathing that the sea shore is seldom seen without numbers of both sexes swimming with perfect ease, as if some species of aquatic creatures," page 20. 1825 Andrew Bloxam : Sandwich Islands. About one P.M. we came up with some fishing canoes, which were immediately hailed by Manuia, one of our passengers; and the fishermen, hauling in their lines immediately, paddled alongside. Although we find that, in her youth, our shipmate Liliah had been accounted one of the best swimmers in the island, and was particularly dexterous in launching her float-board* through the heaviest surf, yet now her sense of modesty, awakened by her residence in a civilized country, induced her to withdraw into her cabin at the sight of her almost naked countrymen. * Float-board: this is a board a little longer than the human body, feathered at the edges, on which these Islanders stretch themselves and float for hours on the water, using their limbs as paddles to guide them, or at other times trusting to the impulse of the waves: the very children have their little boards; and to have a neat float-board, well kept and dried, is to a Sandwich Islander what a tilbury, or cabriolet, or whatever Iight carriage may be in fashion, is to a young Englishman. show that good workmen will make good work in spite of their tools. At these falls we were often amused by looking on, while the natives enjoyed themselves in the water. Some of their exercises, indeed, were almost fearful: they would strip even their maro, and then plunge into the river above the first fall, and allow themselves to be carried down into the deep pool below, in which they would disappear, and then rise again at some distance and draw breath to be ready for the second fall, down which they would go, and then return to the upper rocks to renew their sport; nay, some of them, would ascend the cliffs above, a height of thirty or forty feet, and leap from thence into the water, seemingly enjoying our terror at their daring diversion; but they are like the amphibious animals, accustomed to the water from infancy, and whether rolling about in the surf on their float-boards, or dashing down the cascades along with the waters, seem equally at home. On the 8th August, to our great surprise, land was descried from the mast-head; and as we were uncertain, from its position, whether it was one of the islands discovered by Captain Cook, we bore up for it, and about 3 P.M. we were within two miles of the nearest point. A heavy swell rolled towards the land, and broke on a long chain of coral which appeared to surround the island. Within, it appeared to be wooded, but our glasses were turned landwards in vain to discover either canoes or huts. At length, as we sailed slowly along the north-west side, we were suddenly gratified by the sight of a native emerging from the woods, and placing himself upon a rock, whence he continued to look steadfastly on the ship. Next morning we proceeded to the lee-side of the Island and perceiving several canoes coming off to us, we lay-to about three miles off the shore. The first that reached us was a single man, whose, costume soon convinced us that we were not the first visitors of this solitary place. He wore a straw hat, shaped like a common English hat; and besides his maro or waist-cloth, he wore a cloak of tapa, of the same form with the South American poncho. The language of this man seemed to bear some affinity to the Hawaiian, but not sufficient for any of our people to comprehend him fully; however, we made out that the Island was called Mauti. While we were questioning our visitor, another canoe, of very singular construction, came along- side of us. Sandwich Islands, its form is very different. The prows and waists were two, but the sterns united, so as to form but one, and this stern, curiously carved, was carried up in a curve to the height of six or seven feet above the water's edge. Two persons, who, by their dress and appearance, seemed to be of some importance, now stepped on board, and, to our great surprise, produced a written document from that branch of the London Missionary Society settled at Otaheite, qualifying them to act as native teachers in the Island of Mauti. They were very fine looking men, dressed in cotton shirts, cloth jackets, and a sort of petticoat of very fine mat instead of trowsers. As soon as their curiosity was satisfied, we determined to avail ourselves of their local knowledge as guides, and to go ashore. violent that we got into the natives' canoes, and trusted to their experience to get us safely through: this they did admirablele dexterity, and our passage in the canoes convinced us that no boat of ours could have effected a landing. Our path lay through a shady wood, on the skirts of which, in a small open space on the left, two handsome canoes were building. They were each eighty feet long; the lower part, as usual, of a single tree, hollowed out with great skill. Geoff Cater (1997-2013) : Lord Byron : Surf-riding at Waikiki, 1852.